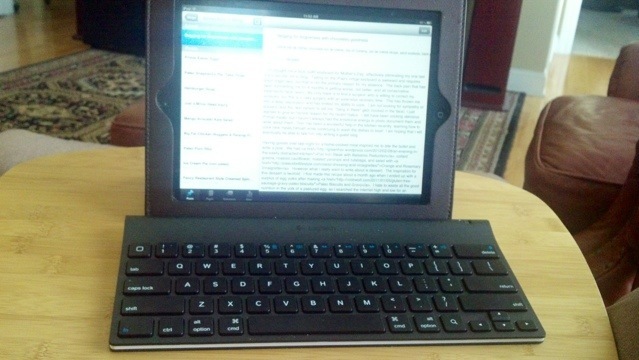 Tom bought me a blue tooth keyboard for Mother’s Day, effectively eliminating my one last sorry excuse not to blog. Typing on the iPad’s virtual keyboard is awkward and requires short fingernails, but that is not the primary reason for my absence. The back pain that has been tormenting me for 9 months is getting worse, not better, and all conservative treatments have failed. My only hope is to find a surgeon who is willing to correct my scoliosis, but this is a risky surgery with an extensive recovery time. This has thrown me into a deep depression, and the pain has limited my ability to cook. I am not looking for sympathy or prayers (and the next person to tell me, “hang in there” gets clocked in the face), I just wanted to give an honest reason for my recent hiatus. I still have been cooking delicious Primal meals, but I haven’t always had the emotional energy to photo document them and write about them. Tom has been a wonderful help in the kitchen recently, learning how to cook new meals himself while continuing to wash the dishes to boot! I am hoping that I will eventually be able to talk him into writing a guest blog. 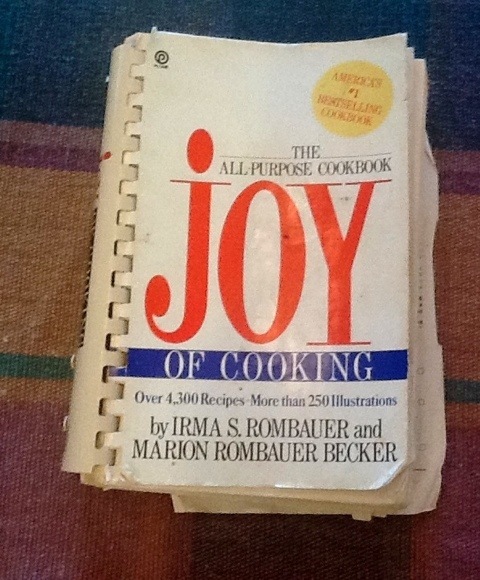 Having guests over last night for a home-cooked meal inspired me to bite the bullet and write a post. We had Flat Iron Steak with Balsamic Reduction, collard greens, roasted cauliflower, roasted parsnips and rutabaga, and salad with Orange and Rosemary Vinaigrette. However what I really want to write about is dessert. The inspiration for this dessert is twofold. I first made this recipe about a month ago when I ended up with a surplus of egg yolks after making Paleo Biscuits and Gravy. I hate to waste all the good nutrition in the yolk of a pastured egg, so I searched the internet high and low for an indulgent recipe to use them in. 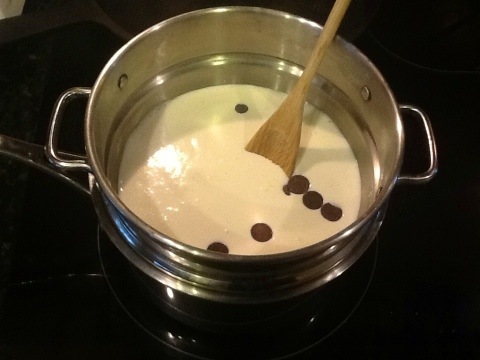 Set up a double boiler and add chocolate chips. 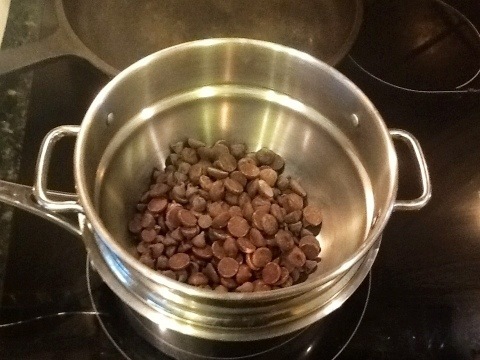 You could also use a high quality dark or bittersweet chocolate bar broken up into pieces, chocolate chips are just easier. The dark chocolate chips in the bulk section of Earth Fare are fantastic. Add milk and cream. You could also use half and half. I’m sure this would be delicious with all cream as well! Coconut milk would probably also work well in this recipe for those who want to avoid dairy. 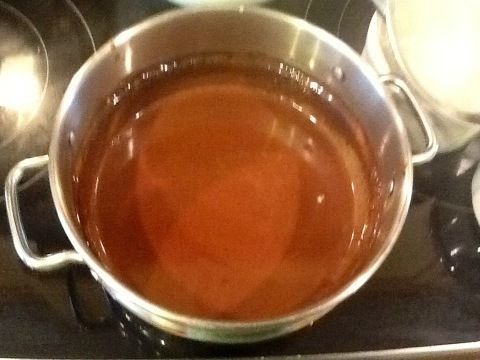 Cook, stirring occasionally, until the chocolate is melted and the mixture begins to simmer. Taste to decide if you want to add any sweetener. Jewel and I felt that the chocolate chips themselves lent enough sweetness. At this point it tasted like the best hot chocolate ever, and we had to restrain ourselves from pouring the mixture into a couple of mugs and drinking it. 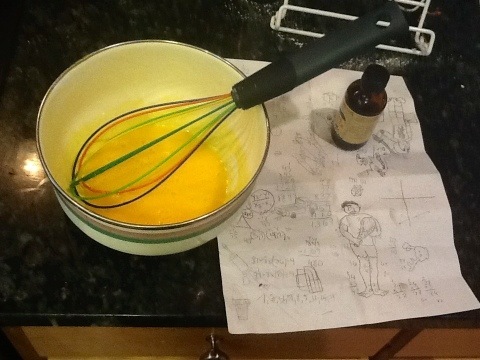 However there was still the matter of the egg yolks. Notice the rich orange color of these yolks, completely different from pale yellow factory farmed eggs. 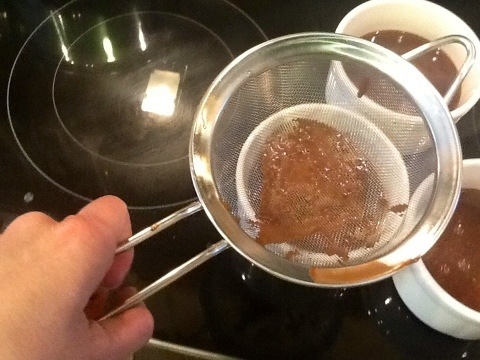 Beat the yolks and the vanilla extract into the chocolate milk mixture. Strain the custard into ramekins or custard cups. It definitely helps to have a second set of hands here! Jewel was more than happy to help with the promise of getting to lick the spoon and clean out the bowl. This recipe was supposed to make 6 servings, but I rather foolishly used my largish ramekins and therefore made only 4 servings. 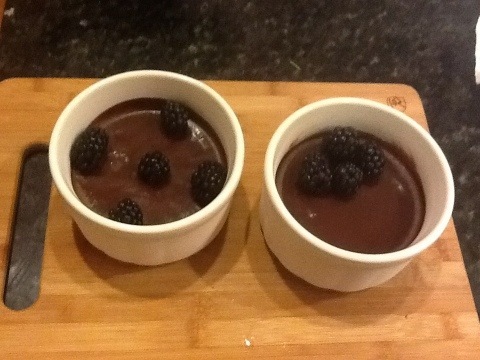 We garnished them with fresh blackberries. Tom gave me his biggest compliment on this dessert. In the midst of gobbling his up, he asked, “How many calories are in this?” I was about to tell him that I hadn’t worked it out when he said, “never mind – I don’t care!” and proceeded to finish his whole serving. Dora and Jewel both thoroughly enjoyed this dessert as well. It is not completely Primal because there is sugar (well I think it’s evaporated cane juice syrup, but whatever) in the chocolate chips, but even Mark Sisson makes an exception for dark chocolate. Because of my family’s rave reviews, I felt very comfortable making this dessert for company. In addition, when Jewel and I went to Auburn for honor band in February, she picked out a Mediterranean restaurant to try and her friend Bobby and his dad Bob went with us. Jewel and Bobby both ordered pot de crème and I’m not sure which one of them was more entranced with it. That was also the night that Jewel drank the little pitcher of cream that I was served with my coffee. This time I was smart and borrowed small ramekins from Mom. I increased the recipe to serve 8, and that worked out perfectly. Of course I forgot to take a picture, but I’m sure that Mom and Dad will want me to make this for them in the future in exchange for borrowing the ramekins. Much to Dora’s disappointment, everyone loved the pot de crème and happily scraped out their bowls. I knew it was a hit when the chorus of, “this is good,” was followed by silence. Bob even said that he thought these were better than the dessert at the restaurant. Oftentimes the simplest recipes are the best. When you start with high quality ingredients it really doesn’t take much effort to make delicious food. 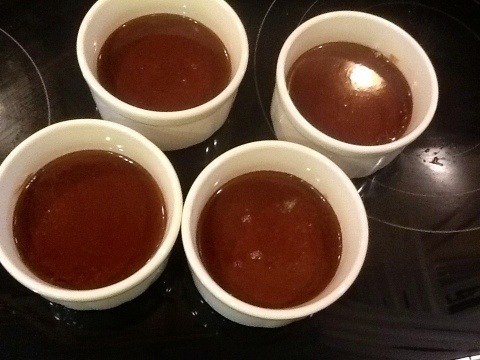 I just made the Pot of Chocolate recipe with Belgium chocolate and coconut milk. Tastes incredible! Thanks for sharing! I'm a mom, a wife, a cardiac nurse and a recovering chronic cardio addict. A week before my goal race, an Olympic distance triathlon, I was sidelined with severe back pain. I am currently following Mark Sisson's Primal diet. Join my family and me as we eat a lot of healthy food and try some delicious new recipes!